NASA! They’re happier on the inside. Cape Canaveral. As a kid growing up in the 70’s, the word Canaveral had a wonderfully evocative sound – the sound of a place where great things happen. You couldn’t call a small country town Canaveral. I had no idea what it meant. What was a Canaveral? 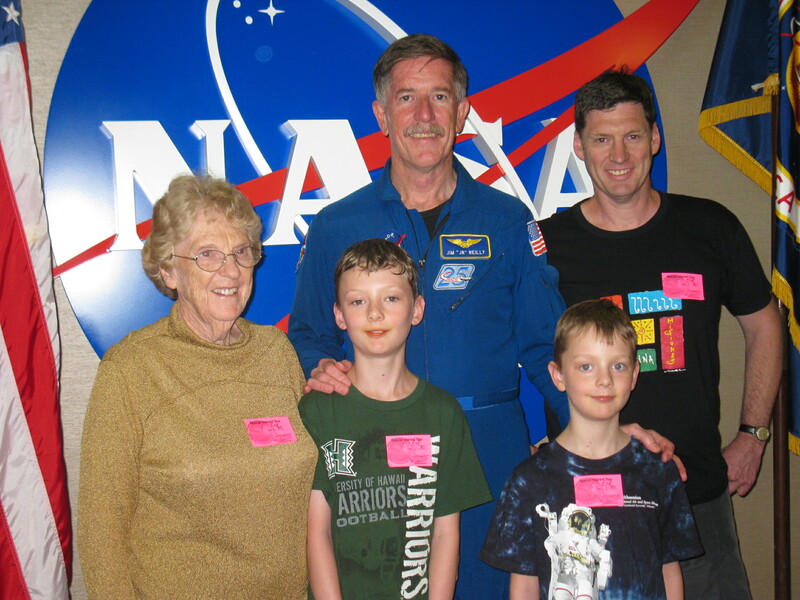 Was there a Mr or Mrs Canaveral? All I knew was that Cape Canaveral was where space travel ceased to be the domain of the unfortunate Robinson family, of the Starship Enterprise, of Thunderbird 5, or of the crew of Moonbase Alpha. 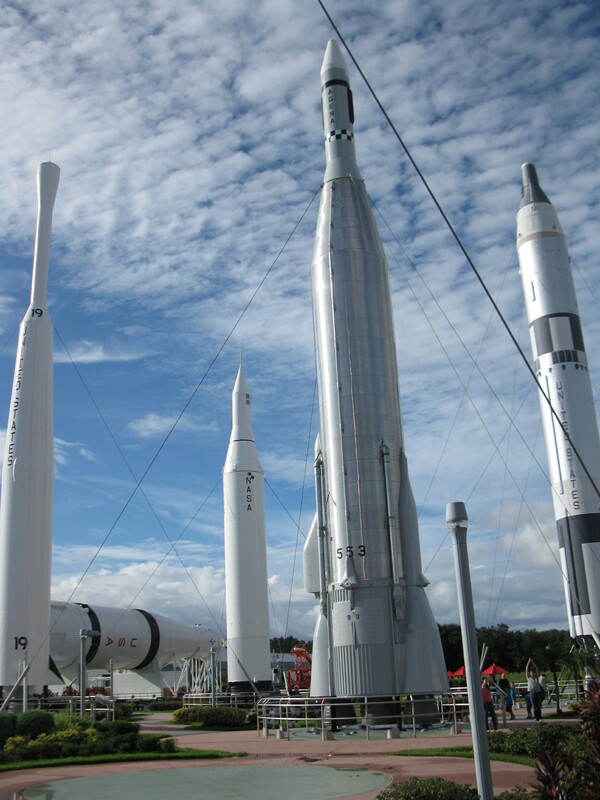 Like most of my friends, those shows were always my favourites, but I knew that Cape Canaveral was where real space exploration took place, or at least where it took off. Even after Lyndon Johnson changed the name to Cape Kennedy to honour the late President, the name Canaveral couldn’t be banished to history, and the State of Florida soon restored the name. My boys also have the space bug, especially Sam. But fortunately for him, he hasn’t had to wait almost forty years to get here. It would be ideal to say that we’ve woken to a beautiful day, but the weather is pretty awful. I don’t really care – nothing is stopping me today. We’re staying in Orlando, and at 8.40am a Mercedes mini-van driving by our guide Nicky arrives to collect us. Nicky’s a fast-talker with quite a strong accent. He gives us a very quick rundown of today’s options and times. I look to Mum – she didn’t understand either. Fortunately Nicky doesn’t seem to mind my frequent requests for him to repeat himself. We aquaplane across Florida for around an hour before reaching the Kennedy Space Center Visitor Complex. It’s time to raise the boys from their iPad trance and rejoin us. The success of NASA’s Mercury and Gemini programs resulted in the need for a visitor center, and the first Visitor Complex opened in 1966. Our first view of the Kennedy Space Center (KSC) is of the Rocket Garden, where rockets from those early missions tower overhead. I don’t tell the boys that those early rockets didn’t come back, and that these are mostly restored missiles with the appropriate paintwork. They’re impressive nonetheless. 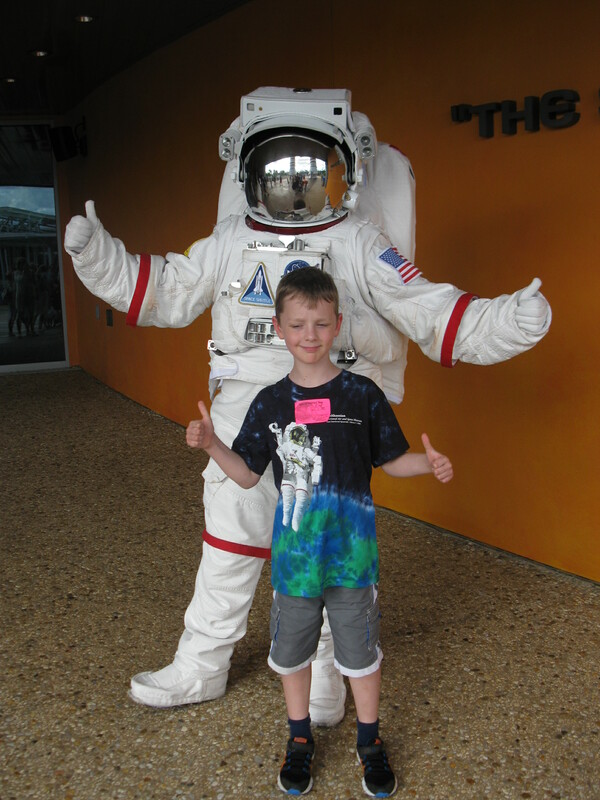 This way to the Atlantis Shuttle Experience…. 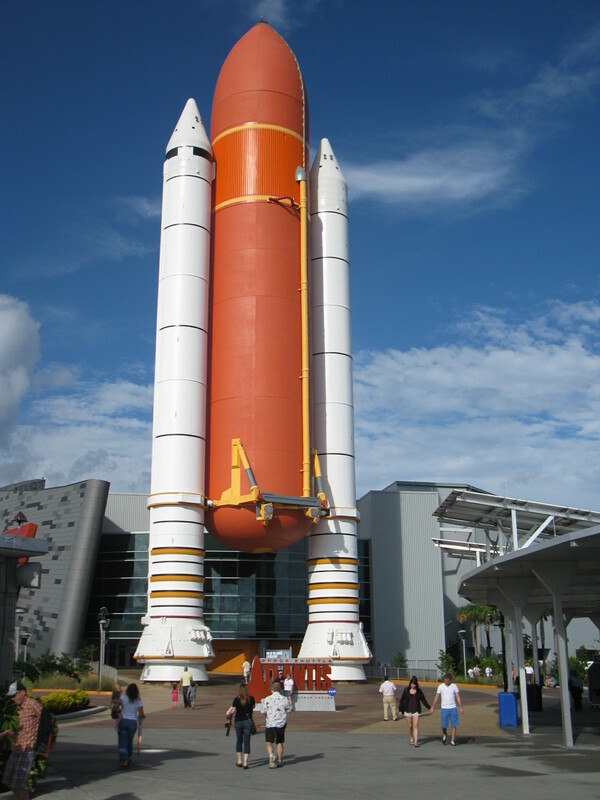 We’re directed towards the “Atlantis Experience” walking under a gateway of full-sized replica solid rocket boosters and the external fuel tank so familiar from footage of the Space Shuttles. They’re massive, dwarfing the building that holds the shuttle Atlantis. The rain continues as we’re passed to a new guide, who is particularly vocal of his family connection to the British Queen. I don’t think he’s aware that just about everyone in the United Kingdom is at least distantly related to the Queen, even me, so no-one is too impressed. He assumes that no-one has heard his references to his “British cousin” so repeats the same leading references, hoping that someone will take the bait. We pretend to be interested in the rain – but we really just want to get started. Finally we’re allowed inside to a theatre and a short movie on the development of the Shuttle program. The movie concludes and with a dramatic fanfare a seemingly opaque wall in front of us transforms into a transparent curtain. 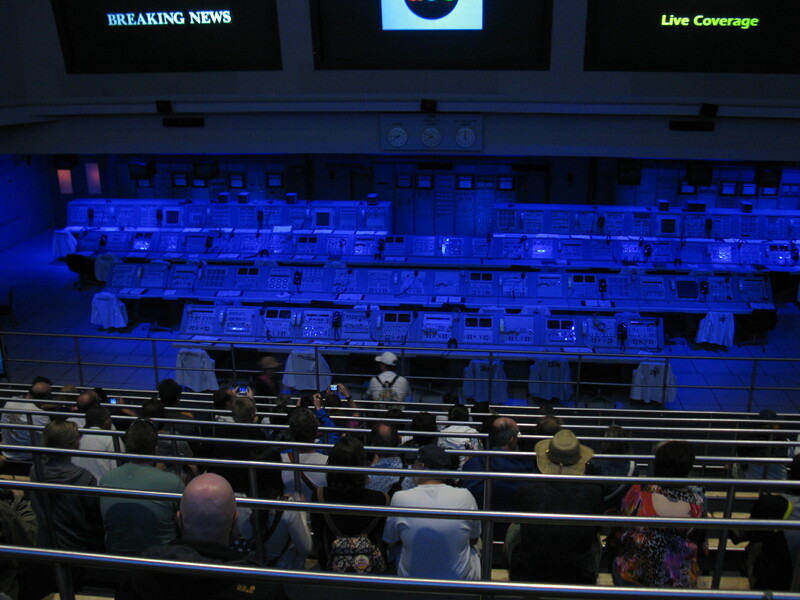 It’s a suitably impressive unveiling, and as the curtain parts we find ourselves directly before Atlantis. 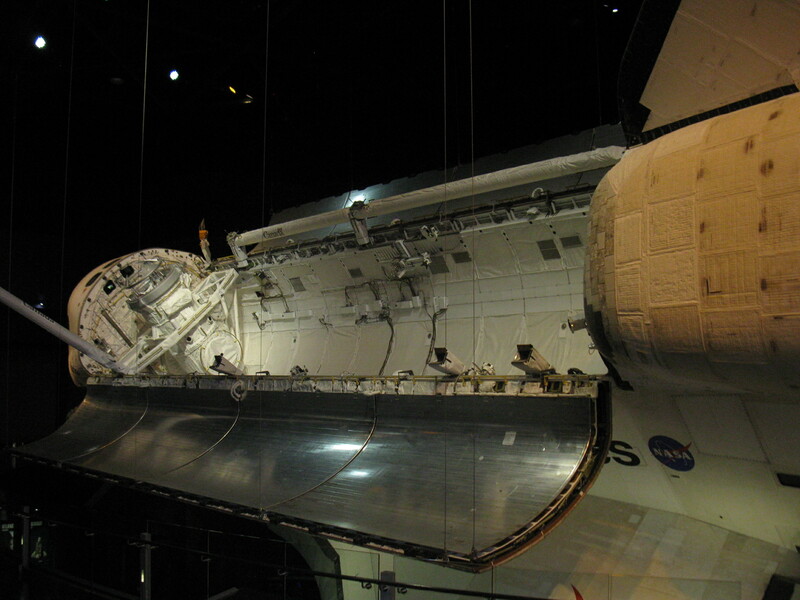 Atlantis was the fourth operational shuttle, taking its first flight in 1985. It was sent on 33 missions, taking 207 crew into space, traveling 125,935,769 miles, deploying 14 satellites and docking with MIR or the ISS 19 times. Its final flight in 2011 was also the final mission of the entire Space Shuttle program, and it is maintained in as close as possible to its condition upon its return. 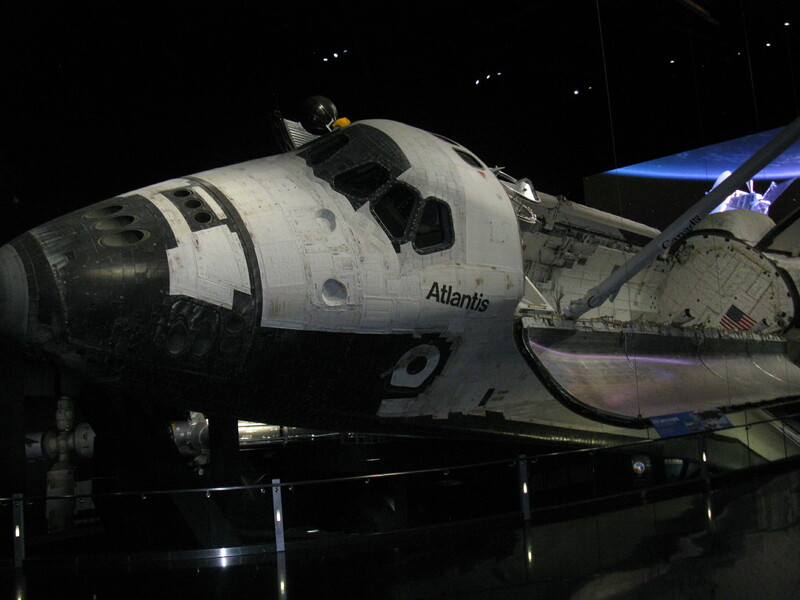 Atlantis’ impressive new home at the KSC Visitor Complex cost over US$100 million, and covers 109,000 square feet. 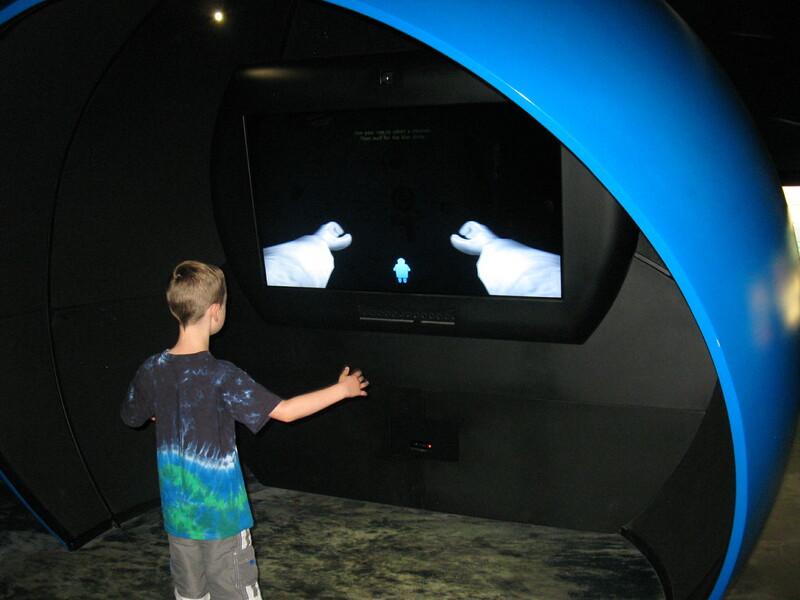 There are more than 60 interactive exhibits, but unfortunately the boys don’t have time to try them all. They do have some fun with astronaut gloves, but lunch is now calling. Research scientist in Antarctica, Antarctic Service Medal. Oil and gas exploration geologist for Enserch Exploration Inc. Expert in the development of new imaging technology in deep water engineering projects and biological research spending 22 days in deep submergence vehicles. 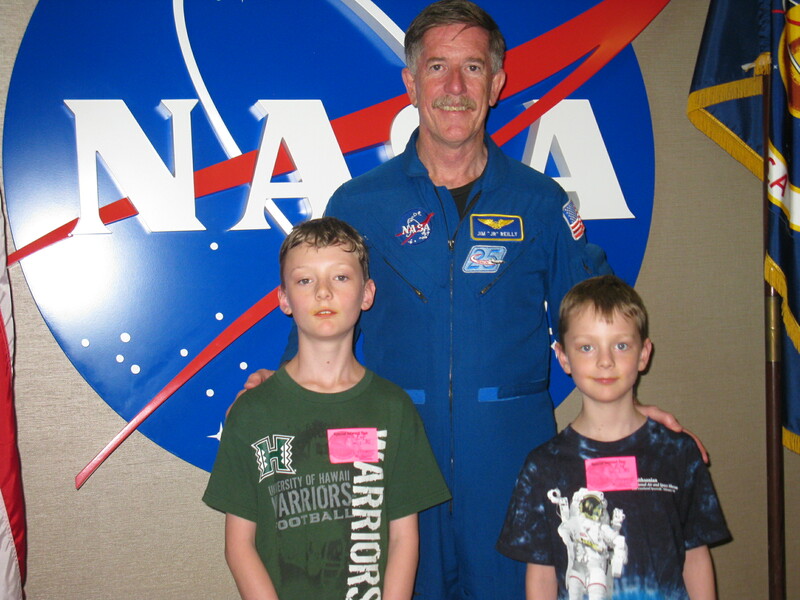 Selection by NASA in December 1994, and crew member on Shuttle missions STS-89 in 1998, STS-104 in 2001 and STS-117 in 2007. 517 hours in space, including three spacewalks totaling 16 hours and 30 minutes. 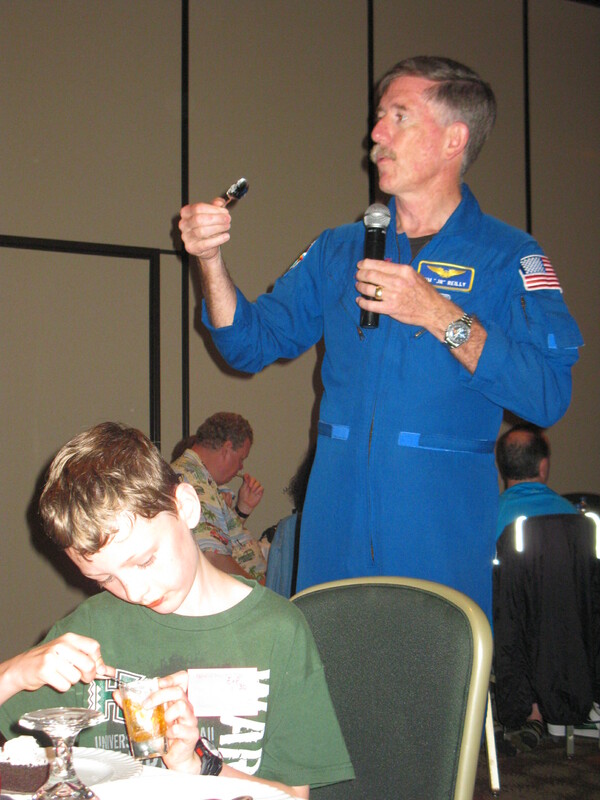 Working on both on the ISS and Mir space stations and appointment as the Astronaut lead on Shuttle training. So, he’s clearly quite an achiever. But despite Jim’s fascinating stories, it’s hard to compete with a good jelly. 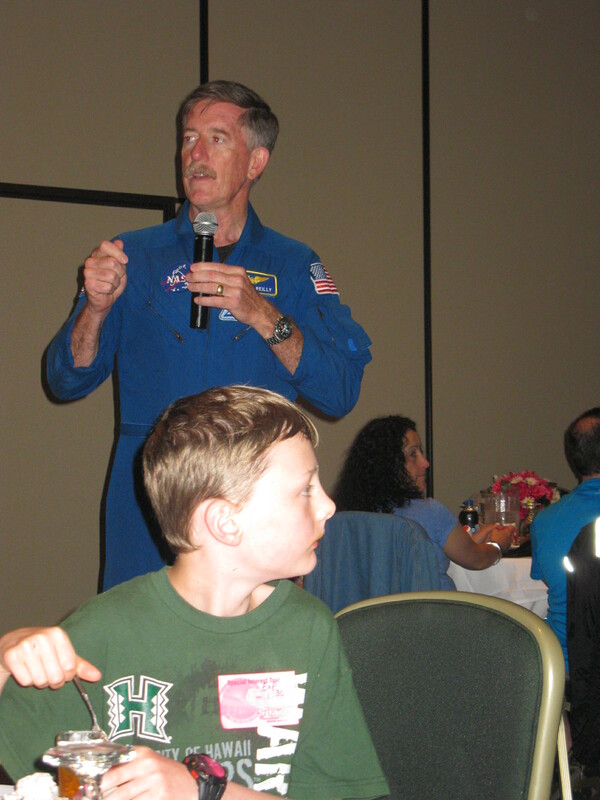 In the Q&A session that follows lunch, Sam and I both get to ask questions (mine doesn’t involve food this time), with Sam’s question leading to a long answer that the crowd enjoys. 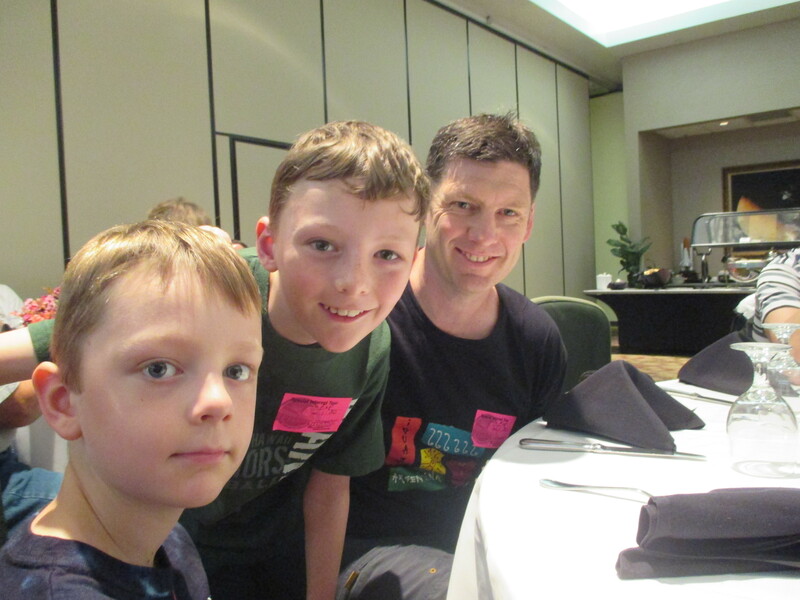 We finish with a few photos – and despite appearances there were after I wiped the jelly off the boys’ faces. They started off looking far worse than this. We’re rushed from the photo session to the bus that will take us to Cape Canaveral and are soon driving past NASA offices. NASA may have spent a lot of money on making the Visitor Center look impressive, but the Admin offices don’t look like the kind of place that has put men on the moon. We’re briefly shown the memorial to Astronauts that have died. We’re told that it used to spin but doesn’t anymore. Hopefully there’s a plan underway for a better memorial than that. 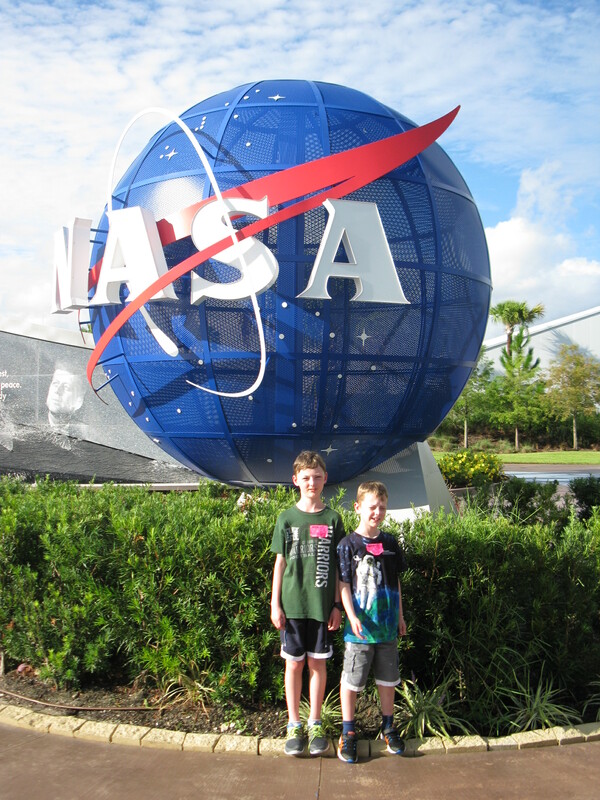 We’re driven via the NASA Causeway across the Banana River to Cape Canaveral itself. Our original plan was to see a launch or a landing, but rescheduling by NASA and then our decision to be based in Orlando for the full week meant this was no longer possible. Our schedule was always going to be inflexible and we knew that the likelihood of a delay was high. We don’t miss a launch by too much though, and when we stop on the Causeway, we can see Space X Falcon 9 rocket through the mist, patiently waiting on Pad 40. Its mission is to boldly supply cargo to the International Space Station, including equipment to improve weather forecasting, a launcher of small satellites from the ISS, and 20 mice who are unlikely to ever see a cat again. No-one mentioned that the launch would be in the middle of the night either, so seeing it with two kids was going to be tricky, but this is what we missed. 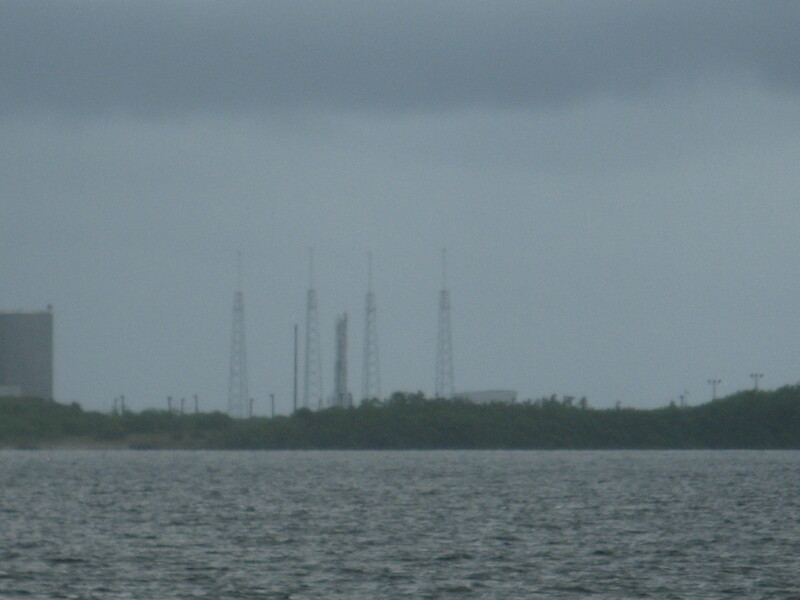 As well as the Pad 40, we can also see in the distance the historic launch pads for the Mercury, Gemini and Apollo projects, in addition to current sites for unmanned launches. 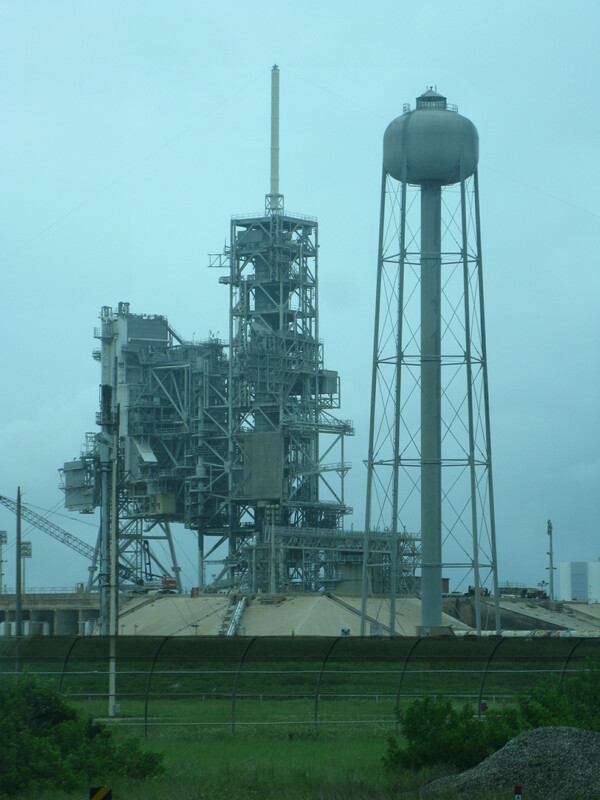 I’ve always assumed that launch pads are re-used, rather than left to decay, and they are – but not forever. 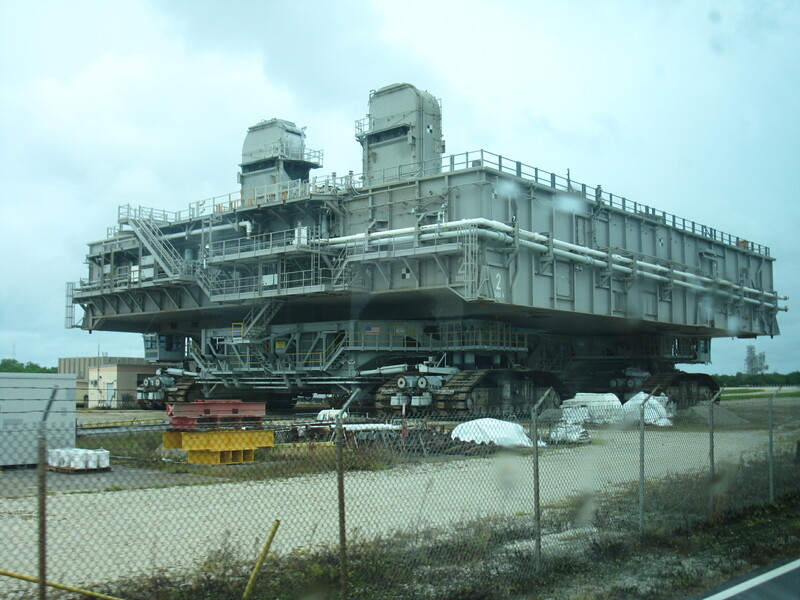 Different launch pads are used for different programs, but the proximity to the Atlantic Ocean creates an ideal environment for corrosion of metal components. Some structures are still standing, while others have been dismantled for safety purposes. Even without the full original launch complexes, the coast is lined with a series of circular concrete reminders of past missions. We head back north towards Launch Complex 39, which includes two current launch pads, the Vehicle Assembly Building (VAB) and the Launch Control Center. The site has been used for the Apollo program, the Space Shuttle program, and is now planned to support launches of the SpaceX Falcon 9. 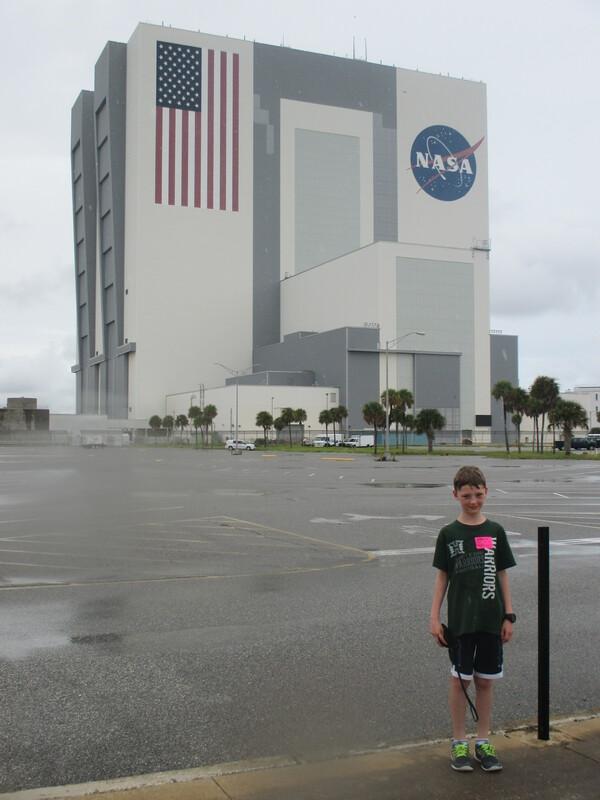 We’re inundated with statistics – the VAB encloses 129, 428, 000 cubic feet and covers 8 acres. 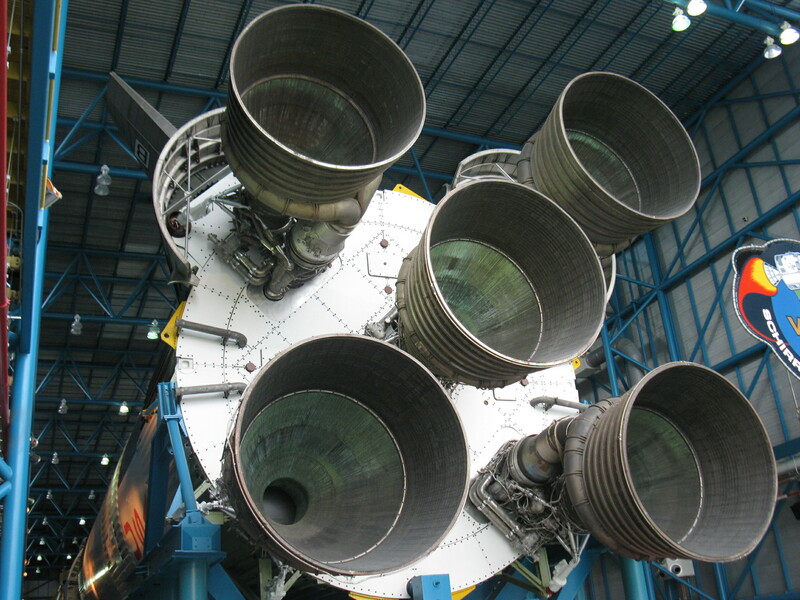 Built in the 1960’s to allow for the vertical assembly of the Saturn V rocket for the Apollo program, at a height of 160m it’s the largest single-story building in the world. The interior volume of the building is so vast that it has its own weather. On very humid days rain clouds can form below the ceiling, which the moisture reduction systems are designed to minimize. And of course the American flag on the side is the largest in the world. 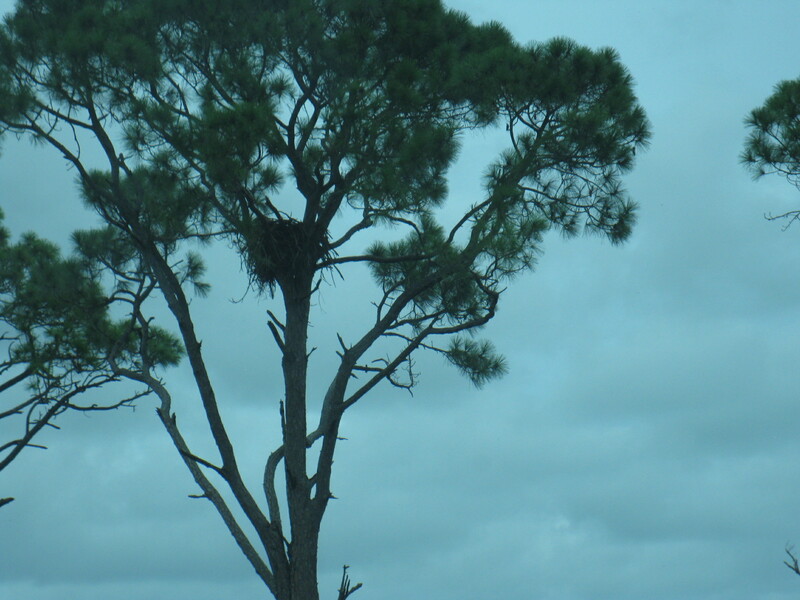 The drive out goes by many ponds – we see one alligator, a few bald eagles and two nests (one has been continuous for 49 years with only two couples), many egrets, black crows, and I just miss seeing a manatee (several times). The most popular joke of the day from various drivers is the one about the guy sent to count gators not coming back. Fair enough, it’s not a bad joke. We stop for views of Launch pads 39A and B, the massive Crawler Transporters (known as Hans and Franz), the seemingly endless landing runway for the Space Shuttle, before we finish at the Apollo / Saturn V Center. It’s getting increasingly hard not to get blasé about seeing these historic sites and equipment. We’re being spoiled today – but the day isn’t over yet. 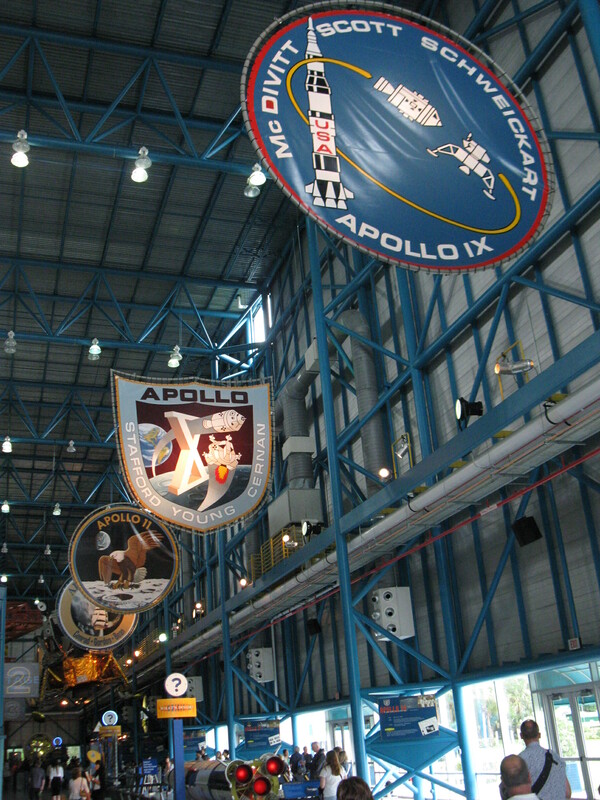 The Apollo / Saturn V Center is a tribute to the entire Apollo program, from unmanned tests starting in 1961, through to Apollo 17 in 1972, the final mission to land on the moon. 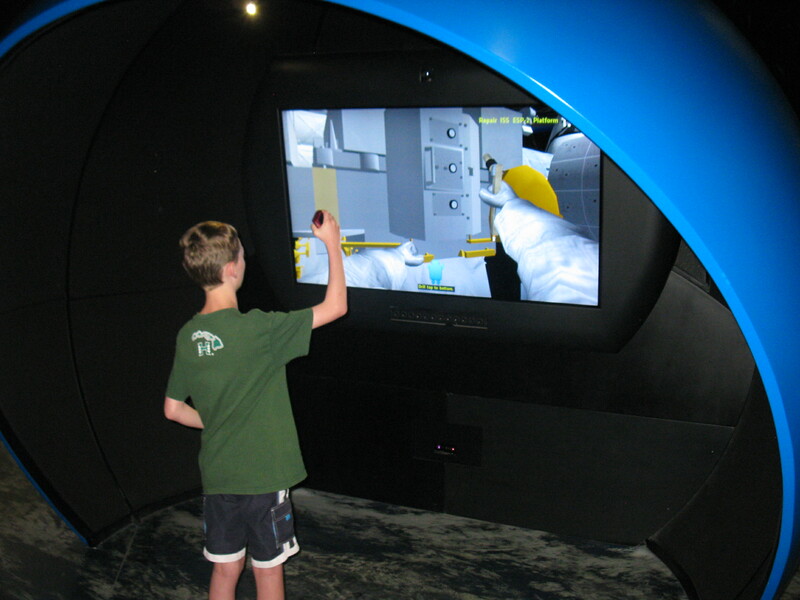 We start with the Firing Room Theater, where we’re shown footage from NASA’s early years, including the fire that killed three astronauts on Apollo 1 during a launch pad test. 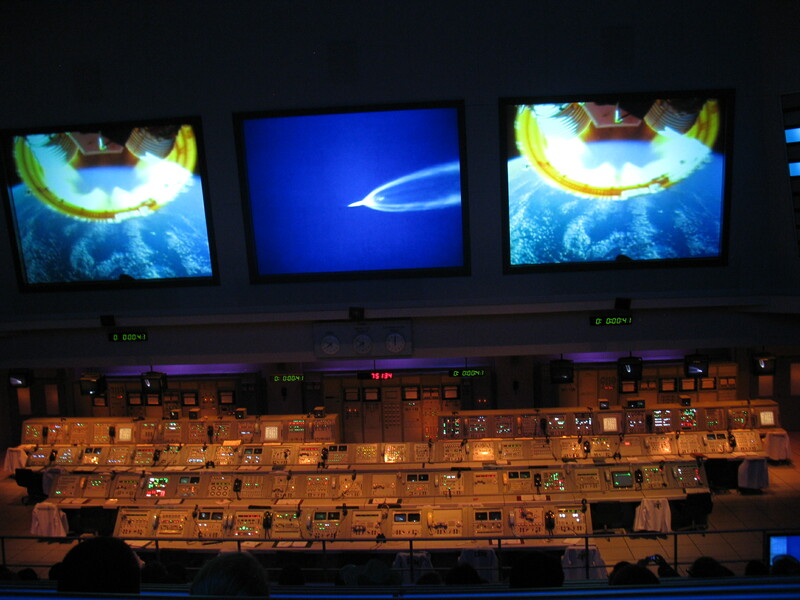 The theater contains the original launch consoles used by NASA during the Apollo program. 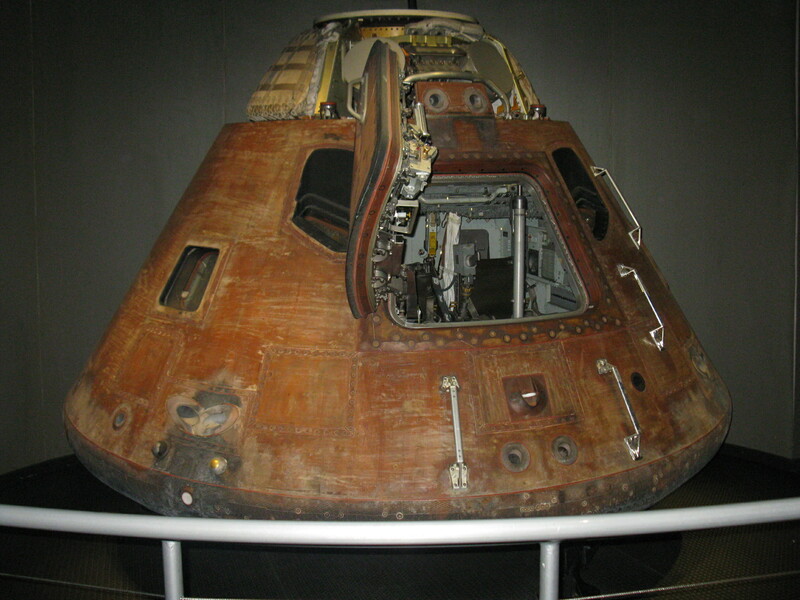 There’s a comprehensive set of exhibits, including original suits still covered in moon dust, the Apollo 14 command module, an unused Apollo service module, an unused Lunar Module, and a slice of Moon rock that visitors can touch. 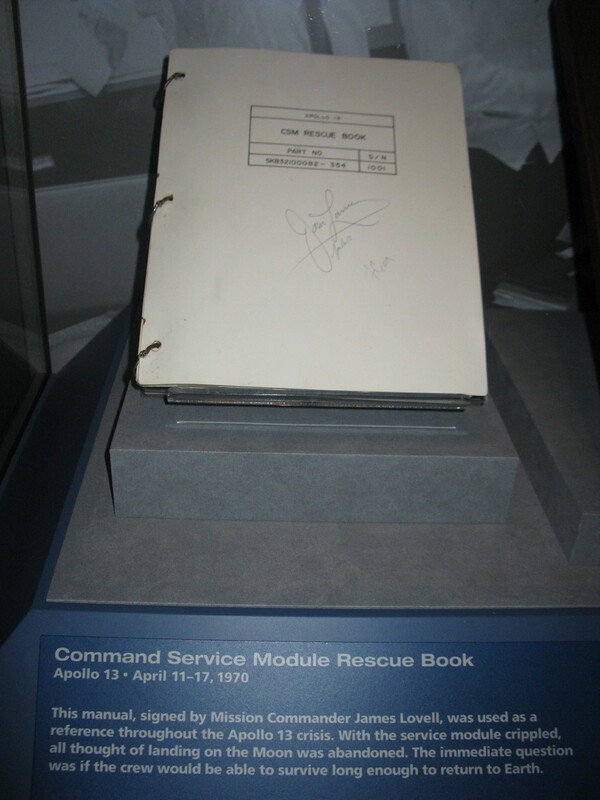 One particularly interesting exhibit is the Command Service Module rescue book, used through the near disaster of the Apollo 13 mission, and signed by the Apollo 13 Commander, James Lovell. 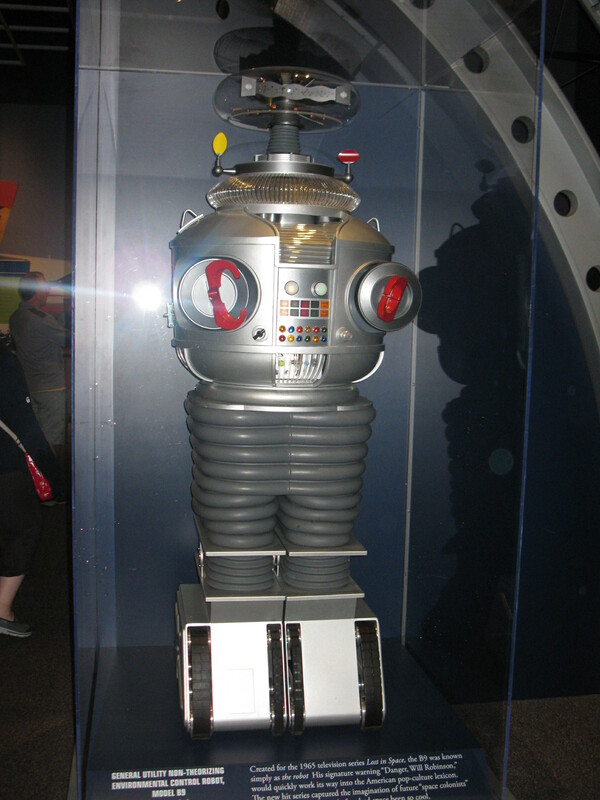 On a lighter note, I recognize a familiar face from my childhood – the Robot from Lost In Space. 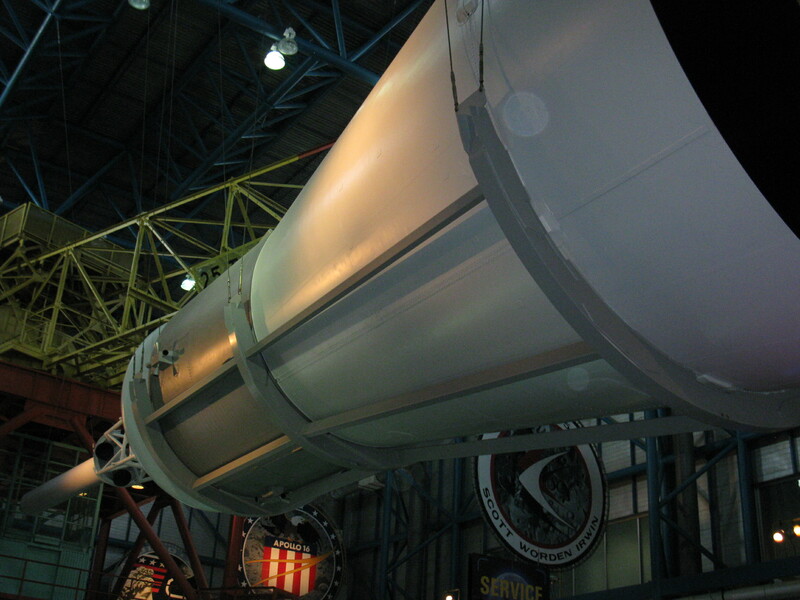 But even in the presence of a Robot celebrity, the highlight is without doubt the fully reconstructed Saturn V rocket. 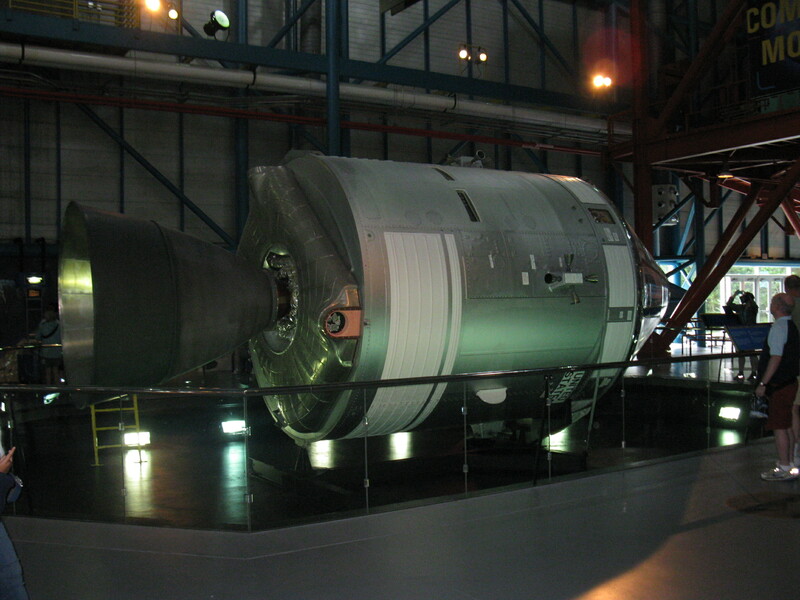 The bottom stage is from a test version, and the second and third stages were destined for the cancelled Apollo 19 mission. 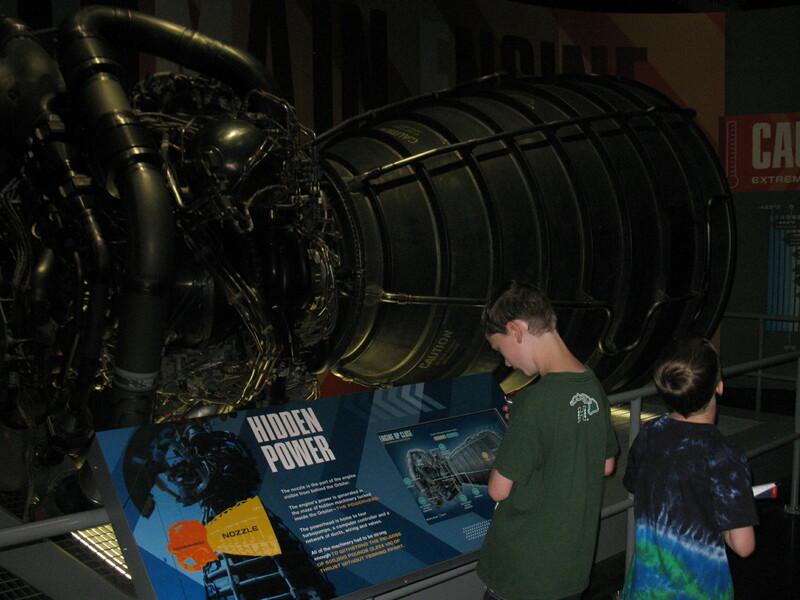 The rocket is 60 feet long and runs the entire length of the Center. 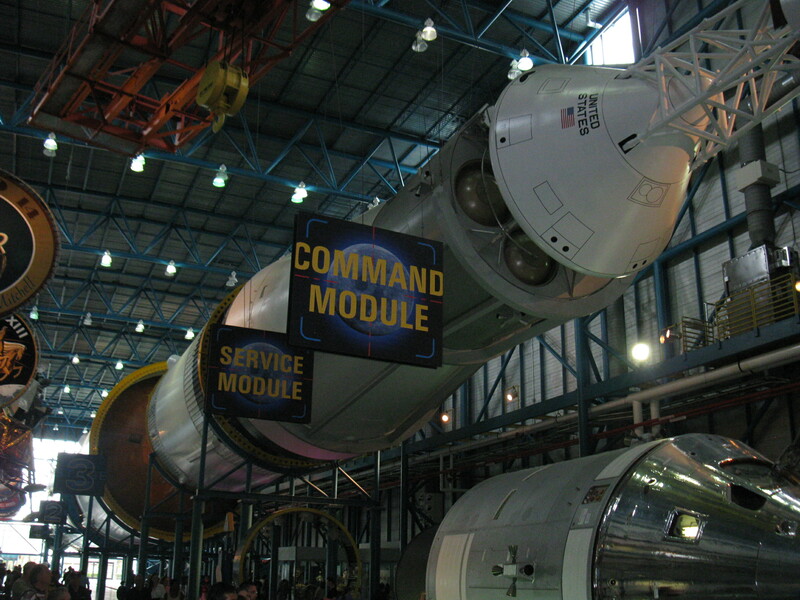 It comprises 3.5 million parts, and assembly at the peak of the Apollo program required 26,000 workers. After a rushed visit to the Gift Shop to track down a second space pen and the obligatory t-shirt souvenirs, we make our way past Constellation Sphere Plaza and the Rocket Garden for the last time. It’s finally stopped raining, and I rush around retaking this morning’s photos, this time with a beautiful blue sky in the background. The weather today hasn’t bothered me, and the boys don’t seem to have cared either. It’s been a long day and while it’s a shame that it’s all over, I know how lucky we are to have made it here. That lunch with Jim was pretty special. I can call him Jim now. Back in Orlando, everyone is keen for an early night – except me. I’m still struggling with my addiction – I have new guidebooks to read and NASA videos to watch on youtube. For me the night is just beginning. 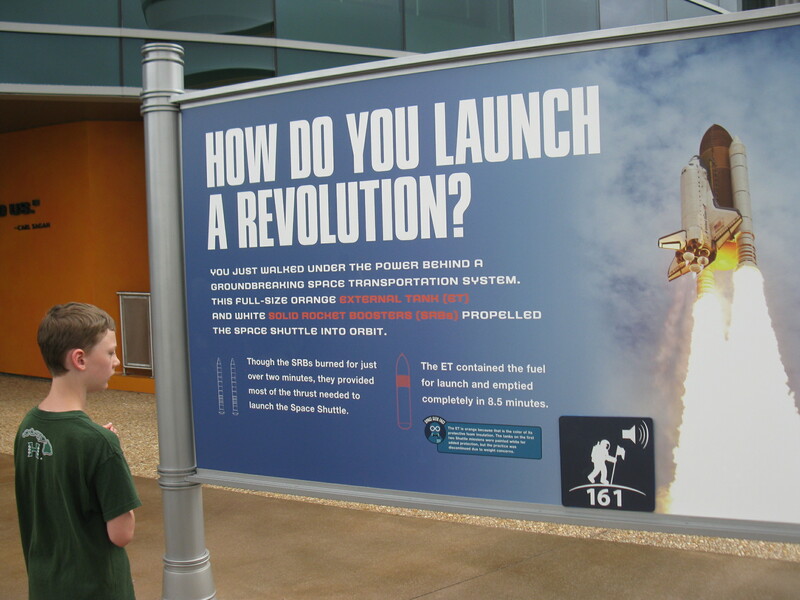 This entry was posted in Travel and tagged Apollo 1, Apollo 13, Apollo 19, Apollo Center, Atlantis Experience, Bald Eagle, Banana River, Cape Canaveral, Crawler Transporters, Falcon 9, Firing Theater, Florida, Franz, Hans, James Reilly, Jim Reilly, Lost In Space, Lunch With An Astronaut, NASA, Rocket Garden, Saturn V, Space Coast, Space Shuttle, SpaceX, VAB, Vehicle Assembly Building. Bookmark the permalink. Thanks for that. I’m so glad we spent the extra dollars and did the astronaut lunch. It was very well done, very interesting, and not too long or too rushed. He gave us a quick run down on his career, and his only fear has been public speaking! He’s clearly over that now. It was definitely worth it – not just for the jelly. 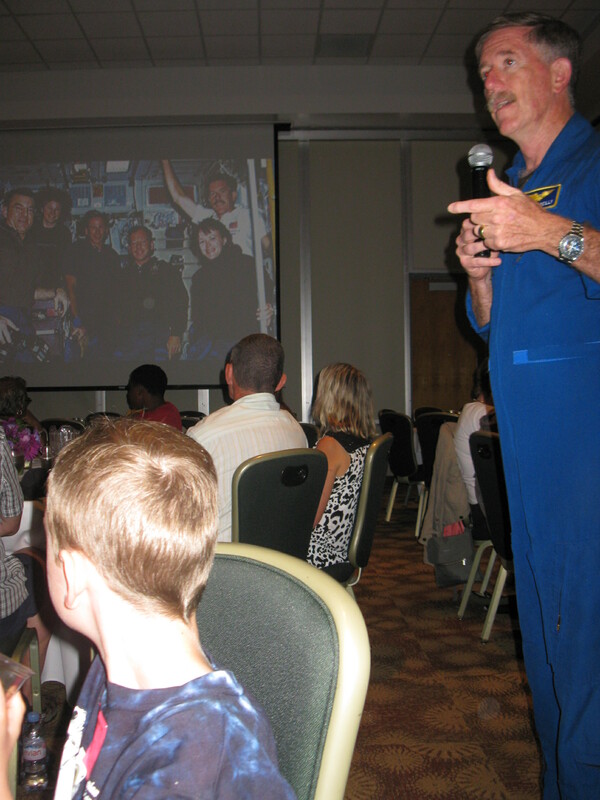 Fond memories at Cape Canaveral! Nice to relive them with you and your family. Hi – yes, it was a great day. Every day was a great day on that trip! We squeezed in a half-day here, it was brilliant. Three highlights in particular: when Atlantis was revealed; seeing the enormosaurus Saturn V rocket; and the 3d imax film screening we caught on our way out which took you inside stars. 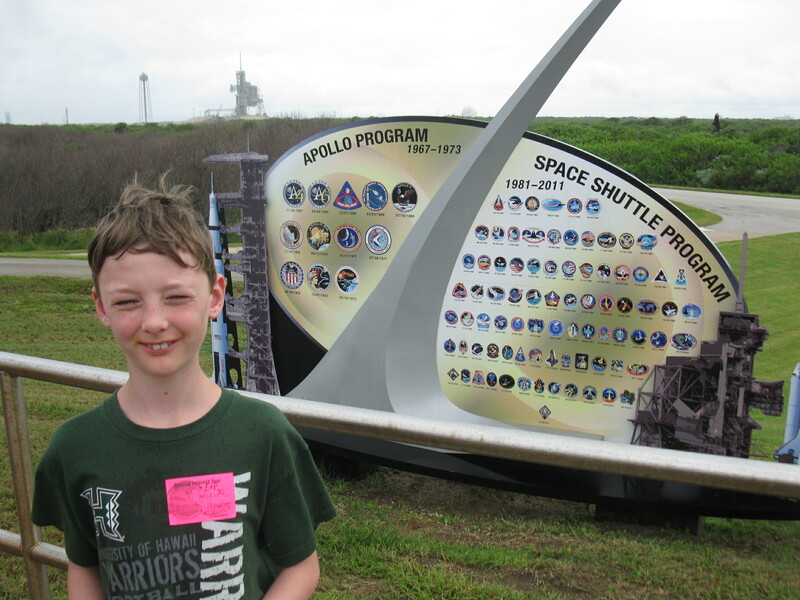 Oh and a fourth, the bus tour out to the launch pads. Yes, I loved this one. I’d been waiting so many years to do this. I didn’t mention the drama of not being to find our tickets for the bus to the launch pads. We did find them eventually – sitting on the backseat of the minivan that took us to and from Orlando. That took some fast talking to get us on that bus! 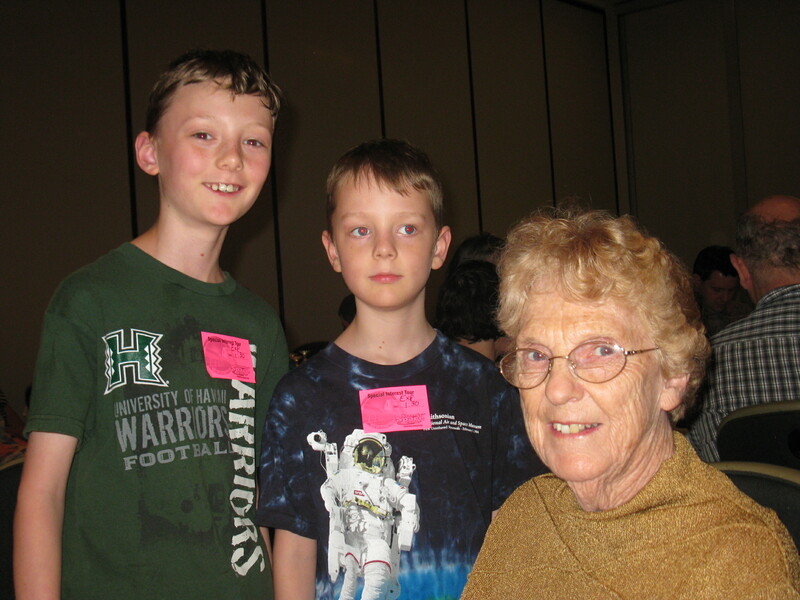 We didn’t see the imax film – I won’t mention that to my boys!